The UN expresses concern over humanitarian situation in Derna and the south of Libya (Photo: OCHA). The UN Office for the Coordination of Humanitarian Affairs (OCHA) has expressed its concern about civilians in Derna and the south of Libya. 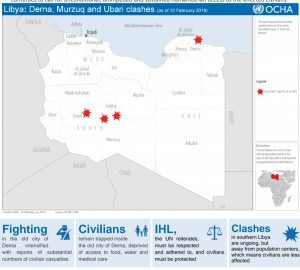 In a report published today, OCHA says thst since 2 February, fighting in the old city of Derna intensified, and reportedly resulted in substantial numbers of civilian casualties. Additionally, the UN has received multiple reports from different sources that several women and children remain trapped inside the old city of Derna, cut off from access to food, water and healthcare. Violence has also been escalating in southern Libya, although, to date, fighting remains localised and takes place away from population centers, which means that civilian casualties and displacement have been kept to a minimum. The UN urged all parties to the conflict to respect and adhere to their obligations under International Humanitarian Law and Human Rights Law, and take all measures to protect civilians and civilian facilities, and continues to call for unconditional, unimpeded and sustained humanitarian access to the affected civilians. In its overview, the report says that since 2 February, fighting in the old city of Derna intensified, and reportedly resulted in substantial numbers of civilian casualties. While it remains impossible to verify casualty numbers, the UN have received credible reports of the deaths of at least four women and three infants since last Saturday. On 9 February, the UN received reports that the LNA had taken over most of the old city, encircling houses which were still occupied. The same day, the Libyan Red Crescent, on 9 February, recovered three unidentified male corpses from inside the old city. Unconfirmed reports indicate that up to 30 individuals had been injured, including one woman who was reportedly hit by indiscriminate shelling. Reports of arbitrary detention have been received- and the Grenada prison is reportedly already hosting some 2,000 individuals from Derna, with local sources reporting that the inmates are being deprived of water and food. The UN has received multiple reports from different sources that several women and children remain inside the old city of Derna. Women and children, who are trapped inside the old city, and are currently in hiding, continue to lack access to basic services, such as food, water and urgent life-saving medical care for the injured. There is a real concern that ongoing fighting and continued besiegement of the old city may endanger the lives of more civilians, including women and children. Additional reports were received that several elderly men were inside the old city of Derna, and that many of the fighters were younger than 18 years of age. The UN urges all parties to the conflict to respect and adhere to their obligations under International Humanitarian Law and Human Rights Law, and take all measures to protect civilians and civilian facilities.The UN continues to call for unconditional, unimpeded and sustained humanitarian access to the affected civilians in the old city. Violence has also been escalating in southern Libya, where, since mid-January, LNA-affiliated groups have been steadily advancing. While fighting in the south of Libya continues to escalate, most battles to date remain localised and are taking place in areas away from the southern population centres. Nevertheless, as per WHO, some four civilian deaths and 31 civilian injuries have been recorded in both Muzruq and Obari since the beginning of February. Additionally, reports were received that some 250 individuals (50 families) left Murzuq towards the north, with safe passage reportedly facilitated through the LNA, who on 8 February also declared a no-fly zone for the southern region. Further small-scale displacement has been reported from central Murzuq city to the down town areas of the city. Although displacement numbers have been kept at bay, the situation remains volatile and the situation had the potential to escalate further, which increases the possibility of the conflict to affect civilians, the report concluded.